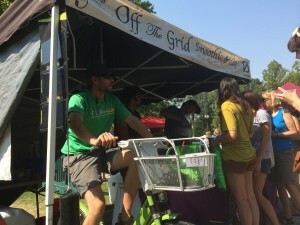 Off the Grid uses a Greenbike to power a blender at the Salt Lake City Farmer's Market on July 19, 2014. They make healthy, high quality smoothies. Tony Pavlantos' smoothie company delivers Greenbike powered smoothies. Off the Grid aims to be ecofriendly.